By the 1st quarter of 2016, there seems to be a peak of activities in the 3 dimensions of my life as can be perceived from my various journals published to date. The photos below will categorize the stories under the 3 modalities which I have defnined or explained on this particular post or another one found here. For the MIND part, we can see a focus of my multi-disciplinary self in Business and Systems development on the social media platform occurring in my life. 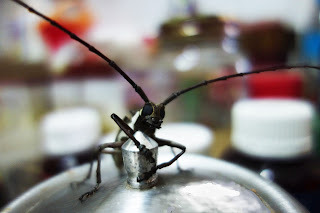 Most of all the above photos are shared in the Year of the Monkey celebration post found here except for the most recent one above of an insect, recently identified to be a Longhorn Beetle. The event falls under the Spirit or spiritual category as may be explained in my recent Facebook post below (at the time of writing this post) where I started a conversation again with Robert Chaen whom I first met online in March 2014 as per this Kuantan post that covered the disappearance of MH370. Coincidentally this part of the post has a series of what is called afterlife signs that lead to the 2nd Anniversary of the disappearance that occurred on 8 Mar 2014. Somebody! Anybody! Can you identify this insect that has been sitting just outside of my balcony door for the past hour and don't seem to want to move? The insect that came on Saturday night, roughly identified as a longhorn beetle, was found outside the balcony near the sliding glass door. When I opened the door to observe it and took photos of it, it stayed very still on the spot for an hour and a half until it was time for me to go to bed. I left the sliding door open in case it decided to come inside. It looked like the beetle did come in to be found on top of my mug cover at a most prominent place on my kitchen table. I took the opportunity to photograph it and videoed my conversation with it. The movements of its leg and feelers/antennae in response to my verbal suggestion, as recorded on the video, made it appear as if it understood my conversation with it! After I finished, it jumped to the top of my plastic juice bottle whereby I decided to carry it to the living room, transferring it onto my indoor plants which were near the sliding door where it was first found. Again I left the door opened in case it decided to get back outside with nature. Later in the afternoon, I checked to see if the beetle was still around by the plants or anywhere else in the living room and as I could not find it, I assumed it had found its way out through the same opened sliding door that it first came through into the home. I, therefore, closed the sliding door. Early Monday morning of 7 March 2016, I was double checking if the beetle was still inside the apartment, searching quickly in the living room area and even called out loud as if it could hear and understand me that I was looking for it. I then sat on my desk to work on the computer with some anticipation that I might still see the beetle, maybe yes or maybe no, and just kept busy with my work. Not too long after, I suddenly saw it walking toward my desk on the carpeted floor below, passing close by to my feet to head towards the bookshelves. I grabbed my camera quickly and only managed to capture on video of it after it passed by my feet to head towards underneath the bookshelves! I tried to find where it had gone underneath the length of bookshelves I have along the wall on the right of my desk but couldn't find it. I went back to work on the computer to post the video with joy on facebook to know that it had found its way back to find me when I was actually calling for it verbally! Then my phone rang, to find that it was my American friend calling from Singapore mentioning that my name had popped up in his mind. This he said occurred when he was discussing Malaysian Church history while talking to our Mission President's wife who lives in Singapore. In another post, Robert gave a link to his most comprehensive article on afterlife signs found here. A specific post he wrote about my insect experience related to the world famous MH370 disappearance is found here. It is not a complete screenshot of the entire message to protect the identity of the VIP but to show that this also happened at a timely moment of 2:36pm on 7 March, about the same time that my American friend from Singapore called after I first made the post on facebook of the Special Guest Part 2 video above. Readers of my writings by now will realize how accurately I like to write my journals, especially when they cover miracles of the spiritual dimension of my life, which I believe came from my training to be a Chartered Accountant. Yes, the Spirit is powerful to guide us to truth and to make decisions that others may classify as irrational as I have shared in a spiritual resume of my life. Click the comment icon in the above fb post to read Robert mentioning that March 8 is the 2nd Anniversary of the disappearance of MH370. 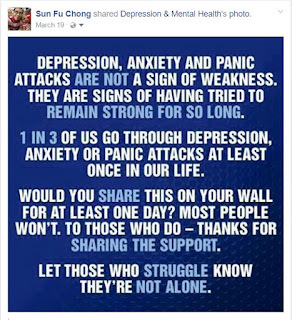 I acknowledged it and later mentioned that it is also International Women's day with a comment that I wondered if this latest afterlife sign is connected to our wives again with reference to a relevant section of my original post on the MH370. Laid to rest on top of my Twin Tower crystal on a lit pedestal in a transparent casing, an appropriate place for the Special Guest beetle that seem to be able to understand my voice. I really had been exceptionally busy not only in the first quarter of this year but also in the last two quarters of 2015. (See 2015 photolinks.) Anyone who knows me a long time can tell that I should be a busy man as a father of 6 children, running several businesses and giving voluntary service to a Church and other NGO's most of my adult life. 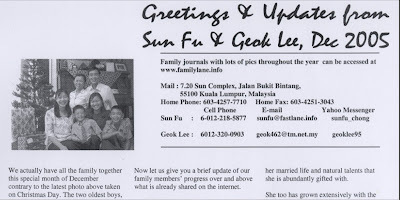 When my life's partner or wife Geok Lee of 30 years suffered a downturn in her health, a major change occurred in my life and for 7 years it was focused on managing the new challenges of our family and after she passed away in 2012, it was spent on how to care for the remaining younger boys of the family as a Mr. Mom, especially the youngest two who were then just 15 and 17, described by me as still 'half boys half men'! Any remaining quiet time I had, it was spent on continuing my personal research and development in life and maintaining the journals that I had started a long time back including this one that this post is on. On the Spiritual side, with the challenges, I had to deal with and the frequent travels between Malaysia and Singapore, no official church callings could be given to me. However, on my own, I never stopped doing missionary work or assisting missionaries, continued my record keeping of Malaysian Church history, doing my own family history work, helping members in need with whatever resources in the sphere of influence as well as doing the Lord's work via the internet. My faith and trust in God never diminished despite all that I have gone through including the love of my fellow men. In fact, my faith in God and his servants have only grown from the tender mercies of God that I had personally received or witnessed during my lifetime. I attribute the criminal acts that my friends had committed to their own personal fears for their own welfare with a lack of faith that God would bless them if they would continue to 'Choose the Right' and the lack of faith in their own skills or talents to provide for themselves or their families. I manage to attend our church temples in Hong Kong, Melbourne and the US during my travels in those difficult times with my wife when she was alive and even after her death by myself. We have been blessed with 2 children who have served voluntary missions for the Church and another preparing to go soon at this time of writing. So what message did the beetle give to me as possible afterlife signs as Robert had shared and I had experienced also a couple of years ago when the MH370 disappeared mysteriously in the month of March also of the year 2014? It was also a time then that I had strongly felt the presence of my wife in Kuantan. Was it an assurance from her again that I am still being blessed from on high? The two phone calls or unexpected connection that happened right after the beetle crossed under my table and feet were truly amazing! I believe the clues as to what was the nature of the message for me can be found in the manner how the beetle was found for the first time, how it was treated by me with its responses and where it was finally found dead in the fourth day. It was found in the balcony of my apartment on the floor outside just near the sliding door. Look at the facebook video below in 2011 of a puppy named Ace I trained at this same balcony to stay outside of the apartment even when the sliding door is kept open. Ace was a stray puppy picked up from a beach in Penang. I had always treated it with respect, training him some behavioral skills but always giving him a sense of freedom always as can be viewed in this post of Ace and how he died. When the beetle was first found on the balcony, it stayed outside even when I had opened the sliding door. I instinctively left the door open to allow it to enter the apartment if it so wished. Puppy in the midst of Temptations! Training a puppy in the midst of temptations. Trying to keep him calm and relaxed in a situation where curiosity and urge to bite things can be better managed by himself following a pattern of getting used to it. Discipline is necessary as a foundation for the dog followed by love. It is a case of Nature vs Nurture just like Man! As per the video above, Ace the dog could be allowed inside when given permission though he was trained to remain out at the balcony even if the sliding door was opened when no permission was given. I would talk to Ace as if he could understand me especially about not biting the wires that he was tempted to do. He also understood me when he was told to sit down on the floor. As per the video below, I would carry out conversations with Ace the dog just as I had carried on a conversation with the beetle who also showed movements as if it was listening. Just figured out who the new puppy looks like! On the fourth day in the morning, I walked into the living room wondering where the beetle would be. As soon as I sat in the sofa in the living room close to the sliding door of the balcony, I saw on the floor a beetle dead that looked similar but wasn't sure as it looked smaller. I checked the white spots on the back and confirmed that it was similar to the photos of the live beetle that I had photographed earlier. I was sad that it had died so soon and my thought was that it seemed to have chosen to die at a place that was visible by the sofa close to the sliding door. It could have easily just died somewhere hidden behind a shelf or cupboard in the living room like where it hid when it was alive. If so I would never have known that it had died so quickly and would have assumed it just went missing or could have found its own way out. In conclusion, there were just too many coincidences in such a short time for this beetle to be regarded just as a normal beetle that wasn't intelligent nor had any purpose to come into my home! What reflection came to my mind on the Beetle experience? The Beetle had actually taught me some things as a metaphor in its pattern of behavior in response to my own behavior towards it. It is a living thing which I believe is a creation of God but not in the same capacity as humans but is a creature created for the purpose of serving Man's needs as Ace a dog had its purpose to be regarded as Man's best friend. In this case, when I saw the unique looking beetle on the floor of the balcony by the sliding door, I did not seek to hurt it nor did I seek to catch it to be put in a bottle. The fact that it remained very still intrigued me as if there was to be some purpose of it being there. So I decided to observe it and see if it would come into my home or just fly away. As it was still not moving when it was time for me to go to bed, I made the decision to keep the sliding glass door open and respected the free agency of the beetle to choose to come in or not. So that started the coincidental like series of events perhaps that seemed to have some meaning to me. Three new things were at a peak of my mind in the first quarter of 2016 in my life. Could this be an afterlife sign for me to know that all these things are happening at a timely moment for me? If so, I must continue with confidence and diligence to carry them out well. In the area of family and relationships, it has been 3 years since my wife passed away. The boys have now grown up to be quite independent of me that they didn't need my close attention nor would they want it. It was time for me to leave the nest as opposed to they leaving the nest in Singapore in western terms. 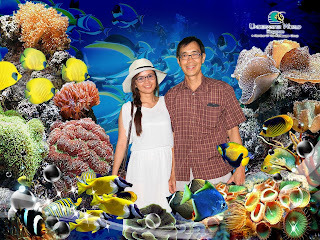 Next was the need to find my own personal companion or life partner which I had started to search and to rebuild my nest in Kuala Lumpur that I had maintained previously but did not really settle down to live a full life and be productive in the city and country of my birth that I truly love. At the same time, I felt it was timely to start the greatest project of my life in the business and social media world that would be a full use and synergy of all my learned knowledge and accumulated experiences to date. I announced the birth of Talklane at the start of the Lunar Year of the Monkey and indeed in my videos of my conversation with the beetle, I mentioned that it had become the early star of some of my first videos with this new brand of video communication that I am creating. The seeds of Talklane was perhaps planted during my sojourn in Singapore as per the videos found in this journal post. Last but not least my business project also encompasses social media features which would be a platform for the vision of the ITC Group of companies & associates that I had co-founded 30 years ago, to help in building up strong communities both at home and abroad that will satisfy my spiritual aspirations. It is not applying technologies in the developing world alone to educate them but also giving them a way to become self-reliant in this unevenly spread economic world of ours. I gave a tiny beetle, insignificant to others, the freedom to choose and in return, it came into my home and left a series of coincidental surprises. It is a metaphor of my life in how I treat others with respect by recognizing their free agency and show them unconditional love to win more love in return like in my familylane relationships. Outside of family, as in my fastlane relationships of business, I do not hold bonds to my employed staff nor the customers or key principals I obtain business from too. I believe I must treat my employees or contractors, customers, and stakeholders fair or good enough that they want to stay with me or want to continue to use my services, not because I have used some force of contractual law or underhanded ransoms to keep them. I believe I acquired a way of life and dealing with others based on my inner beliefs expressed in my years of helping to care for my spiritlane relationships. I also do my best to show unconditional love in my lovelane relationship where without my lover's commitment to me in marriage by earthly law or even in a spiritual temple marriage for all time and eternity, I can easily let go without feelings of attachment, nor feelings of hate or revenge, should they choose to love someone else instead. In personal relationships, I believe women are to be loved and respected to be free agents and cannot be forced to be a partner with man in as much as I believe is God's intention, to build eternal families or relationships that will receive the highest state of happiness in the life after. A Man or Woman can remain as single agents too, like angels, who can be happy alone and bring happiness to others too by being kind and helpful servants like those who serve God in his kingdom I believe. Last but not least, the beetle was a continued sign for me that miracles do happen if I continued my course of living a life that I had found desirable and embarked on just when I turned 21 years of age with early stories of dealing with creatures such as a bird shared here. My faith is strengthened, my personality fortified and I continue to look forward to happiness and peace in my life. I know I am to continue to share my experiences of how to be happy and live an optimal life as written in this post. 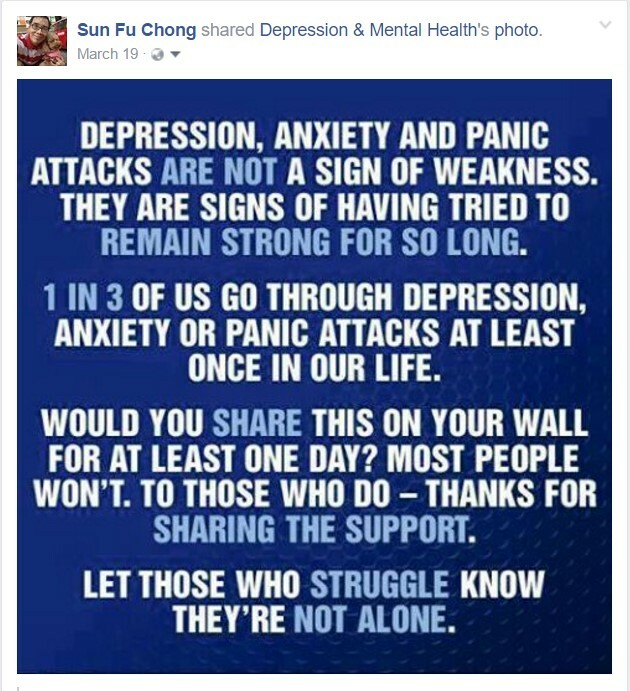 To view the Facebook post, click here. One can click here to see the pics and videos made when he first started his military service in May 2015. I posted the above pic as a comment of my facebook post saying, "The three shooters, One shoots with his camera, the middle is a Sergeant with Arms to shoot and the last is the full lieutenant that shoots commands!" 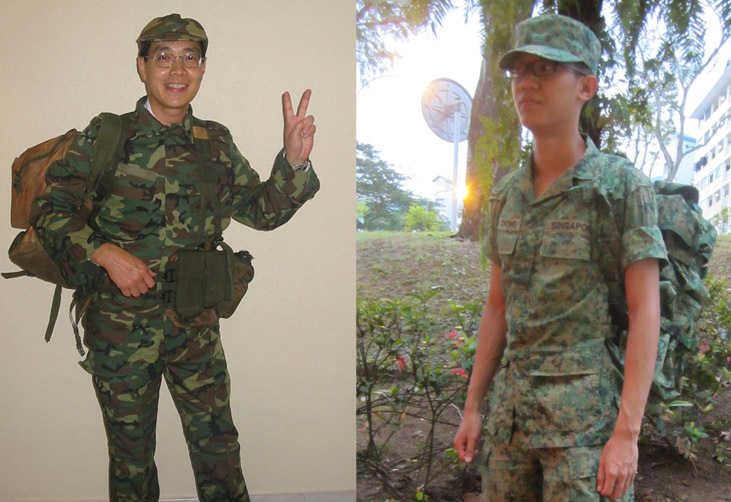 The one who shoots commands is Ern's older brother Shuan who is the predecessor of the boys to be enlisted in the Singapore army to achieve the rank of an officer. He later became the commander of a platoon in the Tekong island BMTC (Basic Military Training Centre). His military training experience and accomplishments, photo shot by his father in uniform on the above left photo, are shared here.